our writers or technical advisors? What was the method of navigation Earhart and Fred Noonan were using to find Howland Island? 1. The method of navigation Noonan used in locating Howland Island is called the single line of position landfall. It entails making a right turn in north and short of the destination and tracking south to Howland Island. The islands (Howland and Baker) would come up on the left side of the airplane giving Noonan a good view from the left distortion free window in the rear of the cabin. Why couldn't the navigator, Fred Noonan, establish his position on this flight? 2. Fred Noonan, the navigator on the round the world flight, only had one bearing (the sun) after 7:30 in the morning in the Howland area which would produce longitude only. They did not know where they were on the line of position (LOP) or latitude. It requires two bearings to establish a fix. Noonan only had one ( the sun). Why did Earhart have so much trouble with radio communications? 3. Earhart switched radio frequencies at a critical time for radio transmissions and lost ground contact with the Coast Guard Cutter Itasca. There was considerable comment from many sources that it was an overt attempt to establish a spy mission; however, at the time of day that the switch was made, it was established procedure to change to the daytime frequency of 6210 KC from 3105 KC. These two frequencies are called harmonic frequencies (6210 is double 3105), and at certain hours of the day they "bleed" into one another. Thusly, Earhart made another serious mistake in selecting her departure time from New Guinea. Arriving in the vicinity of Howland Island at 8:00 A.M. in the morning Howland time meant that the night time frequency of 3105 would be fading and 6210 would be bleeding over taking its place. However, 3105 did not fade and 6210 was not on line at the time the switch was made. It was an impending doom to the Earhart flight. Communication with the Itasca was lost. Why was Earhart flying at the exceptionally low level of 1,000 feet in the approach to Howland Island? 4. One of the incriminating pieces of information that came forth in the Earhart investigation was that Earhart was flying at 1,000 feet at the time that she approached Howland Island. This is an exceptionally low altitude and an altitude that would normally be used in the approach for a landing only. It is not a search altitude. All, virtually all, of the reports that came in from Howland Island stated that the weather was clear in the Howland area. In fact, it was clear southbound all the way down to the Phoneix Islands, but Earhart did not know this. There also were no reports of scattered cumulus which would normally be expected over open seas. The only reported cloud formations were about 50 miles to the north and west of Howland where heavy cumulus was seen. The question of the hour seems to be what was Earhart doing down at 1,000 feet? The only answer is that Earhart was to the north and west of Howland caught up in the heavy cloud formations that were seen in the area. Thusly, the arguments for a right turn approach down the LOP looking for Howland through the distortion free left cabin window are very strong. 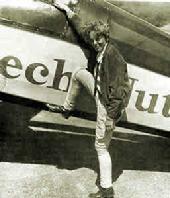 Arguments that Earhart approached from the south of Howland and Baker Islands and made a left turn search pattern are controversial. What were the weather conditions at Howland at the time of the flight and why didn't Earhart see the smoke screen laid down by the Coast Guard Cutter Itasca? 5. Commander Warner K. Thompson of the Itasca radioed at the time that CONDITIONS END OF FLIGHT CLEAR BLUE SKY SOUTH AND EAST OF HOWLAND HEAVY CLOUD BANKS APPROXIMATELY 50 MILES NORTH AND WEST OF HOWLAND PERIOD ITASCA LAID HEAVY SMOKE SCREEN FOR TWO HOURS WHICH HAD NOT DISINTEGRATED AND CLEARLY VISIBLE FROM SOUTH AND EAST FOR 40 OR MORE MILES AT ALTITUDE 1000 FT PERIOD DOUBTFUL IF VISIBLE FROM OVER 20 MILES FROM NORTH AND WEST . . . CLOUDY WEATHER AND EVIDENTLY FLYING IN CLOUDS UNTIL LAST FEW MINUTES OF FLIGHT . . . COULD NOT HAVE FAILED TO SEE SMOKE SCREEN IF SHE PASSED SOUTH PERIOD. If the Lockheed Electra crashed at sea why didn't Amelia Earhart and her navigator survive the crash in a calm sea? 6. The first direction the Itasca took in the search for the (presumably) downed airplane was to the north of Howland Island. In the final appraisal, the Itasca found no evidence that Earhart crashed at sea...north, south or west of Howland Island or that the airplane crashed in the vicinity of the nearby Gilbert Islands or the Phoenix Islands. The Battleship Colorado and the Carrier Lexington accompanied by three destroyers came to the same conclusion. There was no evidence . . . no floating airplane tires, no debris, no life rafts, no floating bodies or life rafts. There was nothing to be found. However, the area they did not search was the nearby or adjacent Japanese held Marshall Islands. The Marshall Islands were declared off limits to the Americans. There is a strain of thought in the Earhart disappearance, that Amelia had discarded her inflatable life raft either in Miami or at Lae, New Guinea, before departure for Howland Island. However, these arguments were not considered credible. The Search by the Battleship Colorado and the Carrier Lexington was based upon the contention that Earhart and Noonan may have ditched at sea and were afloat in a life raft. Otherwise, such an extensive search, the largest in the history of aviation, may have never been made. What were Earhart's alternate plans if they could not find Howland Island? 7. Did Earhart have an alternate plan in the case Howland Island could not be found? Undoubtedly she did. The Gilbert Islands and Tarawa, under British control, would have been a prime alternate. To the south was Gardner Island in the Phoenix Group, but Gardner Island represented the same problems as Howland . . . a single isolated island and in this case an uninhabited island that would have been posed the same problems as an attempt to find Howland. It was not a likely choice and would have meant starvation and very little chance for contact with civilization. It was also the area that was searched by three airplanes from the Battleship Colorado. What was the biggest problem Earhart faced at Howland Island. 8. If Earhart was indeed far to the north of Howland Island, and the decision was made to turn back for the Gilbert Islands, directly to the west would have been the Marshall Islands. Naval officers from the Carrier Lexington who studied the Earhart flight came to the conclusion that the biggest problem Earhart and Noonan may have had was the hot tropical sun blinding them in the face. At 8:00AM in the morning it would have blocked the view of anyone peering down at the ocean and searching for small isolated islands. Gardner Island was to the south and at that time of day would have posed the same problem. The glare from the sun would have been nearly prohibitive. Once again, it was a poor choice for an arrival time. An arrival time of 2:00 P.M. or 3:00 P.M. in the vicinity of Howland Island would have put the sun at their backs and visibility would have been vastly improved. Fred Noonan, Earhart's navigator had one over powering problem . . . only one bearing . . . the sun. Because a 250 foot trailing antenna had been discarded before the Howland leg of the flight, radio reception was severally affected. Beyond any question, Earhart and Noonan were relying on radio direction findings bearings for the critical second "fix" to take them into Howland Island. It was a failure for which there was no cure. Why were radio transmissions so much of a problem in the Earhart flight? 9. There is a phenomenon in the propagation of electromagnetic radio waves that calls for a bouncing effect off the "D" layer of the ionosphere. Depending on atmospheric conditions, this "bouncing effect" changes aviation radio reception and transmissions in the high frequency bands. Because one of the major mysteries of the Earhart disappearance was the sudden cessation of radio communications the "crashed and sank" followers of the Earhart story believe the sudden cessation of radio communications with the Itasca was, and still is, the prime argument. How could a magnetic radio wave reach as far as Nauru Island? The answer has to be the "D" layer of the ionosphere, and the "D" layer of the atmosphere could also explain, in part, the on again- off again transmissions in and around Howland Island. As Earhart switched to the 6210 frequency in the vicinity of Howland, it was at the time of day when atmospheric conditions began to change from the heating of the sun. Radio operators on board the Itasca pleaded with Earhart to stay on the night time frequency of 3105, but the pleas were of no avail. The damage had already been done. The 3105 frequency was still functioning, but Amelia had no knowledge of the error she had made. The heating of the earth's atmosphere absorbed the 6210 transmissions and Amelia's voice was lost forever to the crew of the Itasca. Arguments that the last transmissions of Amelia Earhart occurred in and around the vicinity of Howland Island or that the plane crashed and sank immediately are argumentative and do not support the available evidence. An aviator flying in the cabin of a 1937 vintage twin engine airplane on a long over water flight of twenty or more hours would have unusual stress symptoms in the audible range. Earhart and her navigator, Fred Noonan, would have trouble hearing radio broadcasts from the Itasca, and this affect undoubtedly added to the myriad problems of the Earhart flight. The signal strength "5" transmission that were heard by the Cutter Itasca could have been the result of a bounce of radio waves off the "D" layer of the ionosphere and by no means establishes distance or location. High frequency static over open water cannot be used for navigation or distance measuring purposes. Did Amelia turn back towards the Gilbert Islands after the failed attempt at finding Howland? 10. The facts reveal that Earhart was indeed trying to back track and reach the Gilbert Islands after the failed attempt at Howland. Her pleas for radio contact were heard by a radio operator at Nauru Island. This report was filed with Coast Guard Headquarters in San Francisco. Radio Nauru recognized Earhart�s s voice on three separate transmissions approximately eleven hours after the last broadcasts were received by the Coast Guard Cutter Itasca. 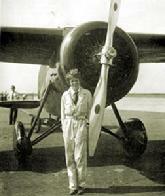 Earhart backtracked on the world flight in the vicinity of Burma as the result of a tropical monsoon. It was considered standard procedure in case of emergency. How much fuel did the Earhart airplane have on board and what was the aircraft's maximum range and and allowable flying time. Earhart flew on time and on route to Howland Island. The Lockheed Electra she was flying encountered 20 knot headwinds. There was four hours flying time still available at the time Earhart arrived in the Howland area. According to the Eric Chater letter, the hallmark of Earhart's fatal flight into yesterday, the Lockheed Model 10E Electra she was flying was loaded on take off at the departure point, Lae, New Guinea, with 1100 gallons of aviation fuel. The preset maximum range or power settings advised by the Lockheed factory was 38 gallons per hour (19 gallons per engine). However, the problem with the fuel computations is that the maximum range factor would not be reached until approximately one-half of the heavy load of fuel had been burned off. If you used a figure of 500 gallons of fuel at 6 pounds per gallon in the "burn-off" period, the total weight loss is 3,000 pounds or the equivalent of an airplane hauling a 1-1/2 ton pickup truck through the sky . . . a heavy load. Ten hours into the flight out of Lae, New Guinea, the maximum range figures would begin to compute. Earhart's instructions from Lockheed Aircraft, Burbank, were to maintain a true air speed of 130 knots. Because the flight was over open water everything is computed in nautical miles. A nautical mile is 15% greater than a stature mile. There is proof available in the mathematical computations of the Earhart flight that tell a story based on their own strength. In specifying 130 knots true air speed (indicated airspeed corrected for pressure altitude and outside air temperature) the specifications that were given Earhart did not include an allowance for winds aloft. The nearest aviation weather station on the Earhart flight was the Naval Air Station Pearl Harbor, over 4,000 miles from Lae, New Gineau, and at best nothing more than an educated guess at what the actual weather conditions would be enroute. However, it is possible to do rudimentary calculations on the range of Earhart's airplane. Arriving in the Howland area in the 20th hour of flight covering 2200 nautical miles computes to 110 knots per hour ground speed. If the established true air speed Earhart was instructed to maintain was 130 knots, the difference between the ground speed and the true air speed equals 20 knots. Thusly, you could say Earhart was bucking a 20 knot headwind on the Howland leg of the flight. These figures are consistent with computations made by naval officers on board the Aircraft Carrier Lexington. The generally conceded fuel computations of flying time remaining on station in the Howland area equates to four hours. Thusly, the Coast Guard Cutter Itasca did not begin its search of the waters around the Howland area until high noon or 12:00 o'clock Howland time. It was the 24th hour of the Earhart flight. It was the hour the airplane would have exhausted its fuel supplies.